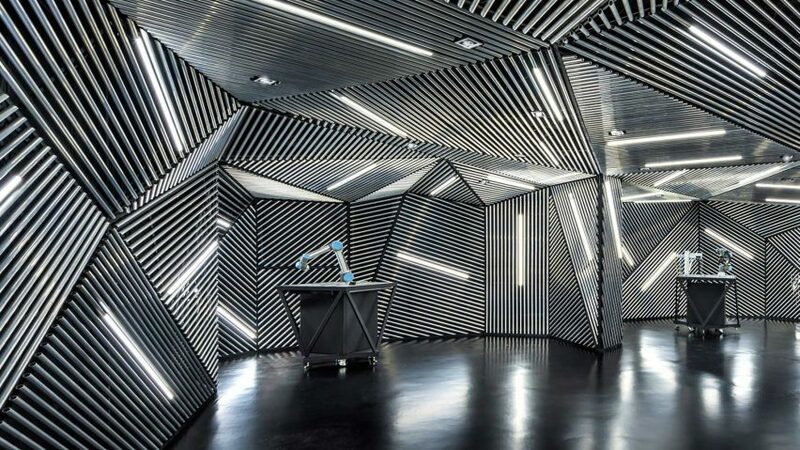 Architects Ministry of Design created this faceted robotics lab in Singapore to train and inspire engineers working with new automation technologies. Aluminium rods and tube lights stick out from the walls and ceiling at divergent angles inside the lab, which is used by robotics education group RACE and located within an industrial park in the mainly residential district of Yishun. The 243-square-metre RACE Robotics Lab serves two main purposes – it acts as a showroom for robots on sale, and it provides space for the company to run industry training workshops. Ministry of Design (MOD) aimed to create a flexible interior that would support both of these activities while also having a strong and "future-forward" look. "The laboratory needed to be a continuous open space, yet conducive for small clusters for hands-on training," said MOD. "We also sought to create an engaging and future-forward spatial experience that denotes the idea of industrial automation and precision." "Overall, the space provides a suitable backdrop to usher in an age of automation and robotics." From the visitor's arrival in the lift lobby – an entirely black space pierced only by the RACE signage and an angular arrangement of white lines – the interior is meant to have a disorientating effect. An oversized door pivots open from the lobby to allow entry into the robotics lab itself. While this space is also painted all black, the walls and ceilings are covered with a three-dimensional "second skin" of linear elements built from hollow, hand-cut aluminium tubing and LED strip lights. The panels are placed at odd angles to each other, with the "random sprinkle" of strip lights helping to emphasise the faceted effect. While the placement might look random, it is built to a plan that creates nooks within the open space for small-group activities. Because the metal panels stick out from the walls and ceiling, they also have the advantage of hiding the many cables and sockets necessary for a functioning robotics labs. These can be reached via access hatches. MOD also designed the graphic identity for RACE, which can be seen on the logo in the lobby. The spatial-design practice was founded in 2004 by architect Colin Seah and has completed projects including Singapore's Club Hotel, filled with statues that have their heads in the clouds, and the layered office building 100PP. The firm won an Inside Award in 2011 for the design of its own office interiors.